The economy continued to add jobs at a steady pace last month and the unemployment rate remained low. 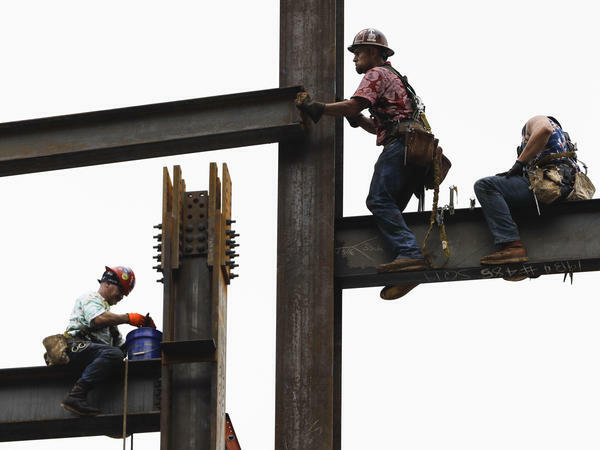 Private analysts had estimated that about 190,000 jobs were added in July, and they had expected the unemployment rate to inch down to 3.9 percent from June's 4 percent. Before this year, the last time the jobless rate was this low was in 2000. In July, average hourly earnings increased by 7 cents, to $27.05. That level is up 2.7 percent over the prior year, the same as June's pace. With the economy at full employment and hiring managers struggling to fill open positions, wages normally would be expected to start rising at a faster rate. But, as NPR's Yuki Noguchi reports, "some economists say that should add up to wage growth rates of about 3.5 percent. Instead, wages are increasing at a 2.7 percent annual rate." And when factoring in the cost of living, those increases look even weaker. It's no wonder that more jobs are available. The economy picked up dramatically in the second quarter. The 4.1 percent pace — lifted by jumps in consumer spending and exports — was the strongest in nearly four years. But President Trump called the numbers "very sustainable," adding: "This isn't a one-time shot. ... Next quarter, I think it's going to be outstanding." This week, the Federal Reserve noted that the labor market has "continued to strengthen" and that the economy overall has also been strong. "Job gains have been strong, on average, in recent months, and the unemployment rate has stayed low," it said.